This is my favorite sketch pad. The 9/12 Aquabee Super Deluxe 808. 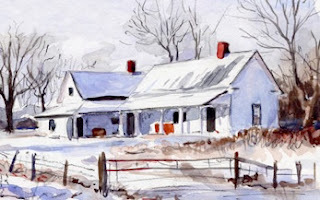 David Millard writes about this one in his book "The Joy of Watercolor". The paper has nice texture and heavy enough to take all kinds of watercolor washes. I mailed my Christmas package today. I thought I would have to wait in line a long time, but the PO folks were fast at the Hickory Hollow PO. 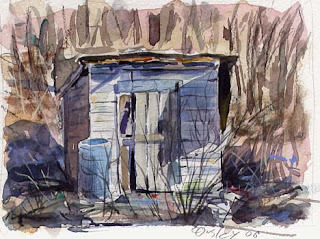 I still had plenty of time to sketch this barn that will soon be gone. I got home and watercolored my sketch. 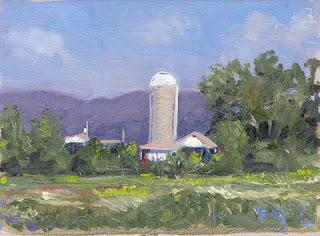 Oh yea, there was a hawk perched on the barn checking me out while I drew. 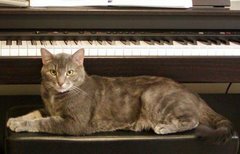 I wish he would come over to my house and eat those damned squirrels that eat the suet and bird seed. I say squirrels are just bushy tailed rats with good PR. 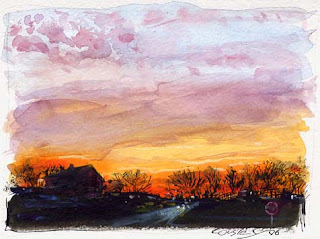 A quickie late afternoon watercolor from the car in Nolensville on Rocky Fork Rd. 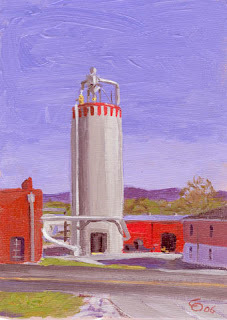 This is a part of a plant in McMinnville TN. A nice crisp fall day. St. Johnsville is a neat little town. 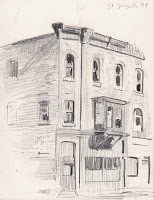 Plenty of old homes and buildings to draw. 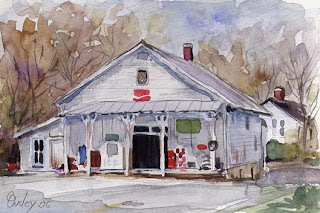 Be sure to visit Parkside restaurant. I believe Dr. Sodhi has an office in this building. 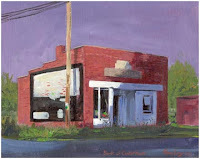 A place called Smoker's Friend in Canajoharie. I don't smoke, but I bought a cup of joe and sat in my car and drew their shop while drinking my coffee. Details of an old building in Little Falls that is on the river. I may do a painting of it. 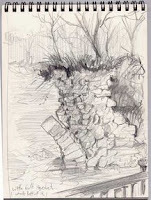 This is what is left of the old aqueduct in Little Falls. It's good to carry a little sketchpad around. 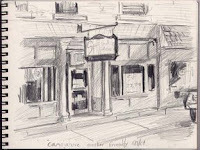 Here are some sketches I did in St Johnsville, Canajoharie and Little Falls NY. People like the way I talk up there. By the way, the best pizza I have ever had is from a place in Palatine called Gabriana's. Pay them a visit and eat some pizza. This is the old A.J. 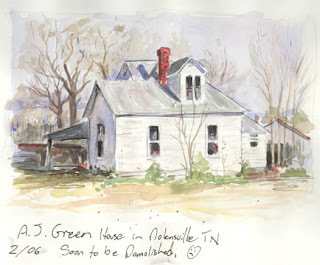 Green farm house in Nolensville TN. It is still standing but not for long. McMansions are starting to enroach. I expect to see it razed each time I drive by. It's up to we artists and photographers to record them before it's too late. 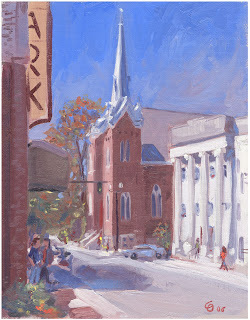 A fall day in McMinnville TN. McMinnville is a great little town. I have met a lot of nice folks there. Check out the coffee shop on Main Street as well. 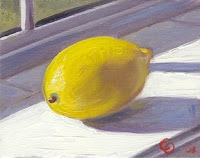 Sun Lit Lemon oil 4/5 inches $30.00 If interested in buying email me. I always see this old abandoned bank on my way to McMinnville TN. No money left in there, I checked. 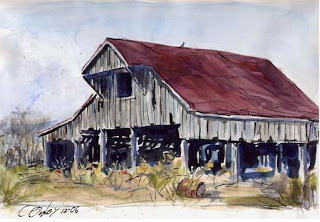 I wish someone would fix it up, it would make a nice shop. Oil 8/10 $30 If you would like to buy this please email me. 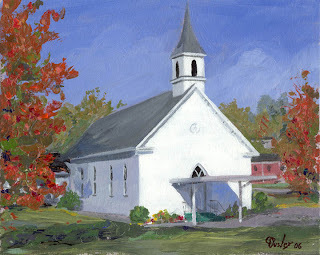 Viola Church of Christ, Acrylic 8/10. 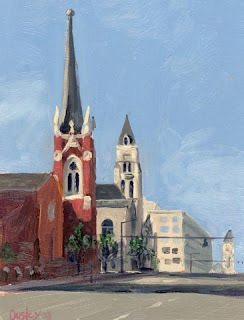 I have always enjoyed painting and drawing old Churches and structures. Plenty of good ones here in Middle TN.